President Trump’s “America First” policies have meant the abdication of the U.S. as a world leader. That’s especially true for LGBTQ rights, which Trump and his acolytes have systematically attacked, in marked contrast to his predecessor. It’s also especially true when it comes to foreign affairs. President Obama challenged African leaders on LGBTQ rights and moved swiftly to implement marriage equality in the U.S. (after he evolved). Secretary of State Hillary Clinton declared LGBTQ rights as fundamental human rights. But Trump has cozied up to some of the most vicious bigots on the planet, starting with his pal, Russian president Vladimir Putin. So if the U.S. isn’t going to be a world leader, who will? Canada co-chairs and helped create the Equal Rights Coalition, a group of 40 nations dedicated to protecting LGBTQ people. Canada insisted that LGBTQ protections be included in the new trade agreement with the U.S. and Mexico, much to the ire of conservative Republicans in Congress. While the Trump administration has been denying asylum to LGBTQ immigrants despite legitimate fears for their lives, Canada has been welcoming them, not only from Central America but from Indonesia and Chechnya too. Canada’s high commissioner to Tanzania, Pamela O’Donnell, challenged President John Magufuli about his country’s anti-gay crackdown, and Canada is debating whether to cut foreign aid in protest. The U.S. merely warned its citizens to be careful there. Canada’s ambassador to the Ukraine, Roman Waschuck, called out the country’s far-right forces after a brutal attack during a transgender rights rally this month in which a Canadian journalist was injured. All of this is on top of Canada’s domestic policies, which include not only job and housing protections (passed in 1996) but also protections based on gender identity and expression. The country also forbids hate propaganda directed at LGBTQ people, a stark contrast to the alt-right hate fest currently underway in the U.S.
Just as the U.S. is rushing backwards — because that’s the direction that Trump wants it to head — Canada has been forging forward thanks to its prime minister, Justin Trudeau. 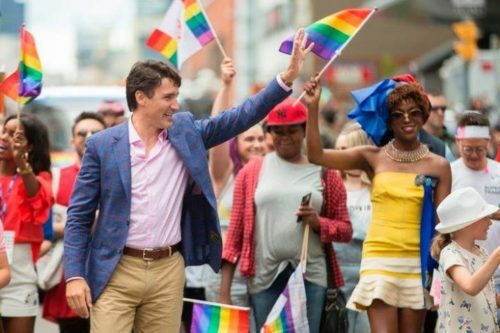 Trudeau has been the polar opposite of Trump, marching in a gay pride parade and apologizing for the country’s past treatment of LBGTQ people. Trudeau has also personally reached out to individuals, including sending a message to a gay man who was the recipient of homophobic Valentine’s Day card at work. Trump hates Trudeau because Trudeau refuses to be bullied by him. As with so much else with Trump, the dramatics obscure the real policy issues. Canada is showing us, and the rest of the world, what pro-LGBTQ policies look like. Of course, in typical Canadian fashion, it’s not making a lot of noise about it. Indeed, if you ask Canada, it calls itself only the third most LGBTQ-friendly country in the world. But to the LGBTQ community in the U.S., it’s an oh-so-close example of what our country should act like.